Janis, C. M. and E. Manning. 1998. Antilocapridae. Pages 491-507 in Evolution of Tertiary Mammals of North America. C. M. Janis, K. M. Scott and L. L. Jacobs, eds. Cambridge University Press, Cambridge. Jiménex-Hidalgo, E., O. Carranza-Castañeda, and M. Montellano-Ballesteros. 2004. A Pliocene record of Capromeryx (Mammalia: Antilocapridae) in México. Journal of Paleontology 78(6):1179-1186. Morgan, J., and N. H. Morgan. 1995. 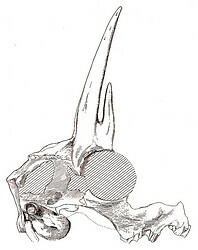 A new species of Capromeryx (Mammalia: Artiodactyla) from the Taunton local fauna of Washington, and the correlation with other Blancan faunas of Washington and Idaho. Journal of Vertebrate Paleontology 15:160-170. Hagerman: Where the Deer and the Antilocaprids Played. 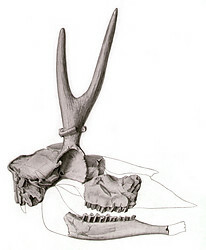 Hagerman Fossil Beds' CRITTER CORNER by Dr. Greg McDonald. Furlong, E. L. 1925. Notes on the occurrence of mammalian remains in the Pleistocene of Mexico, with a description of a new species Capromeryx mexicana. University of California Publications in Geological Science 15(5):137-152. Furlong, E. L. 1927. The occurrence and phylogenetic status of Merycodus from the Mohave Desert Tertiary. University of California Publications. Bulletin of the Department of Geological Sciences 17(4):145-186. Page: Tree of Life Antilocapridae. The TEXT of this page is licensed under the Creative Commons Attribution-NonCommercial License - Version 3.0. Note that images and other media featured on this page are each governed by their own license, and they may or may not be available for reuse. Click on an image or a media link to access the media data window, which provides the relevant licensing information. For the general terms and conditions of ToL material reuse and redistribution, please see the Tree of Life Copyright Policies.